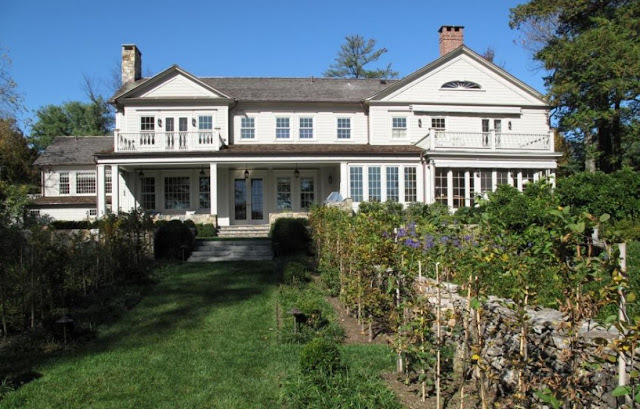 A Martha Moments reader wrote to me this morning to share a link that featured photographs of the newly renovated Turkey Hill, Martha's former home in Westport, Connecticut - the house where she began her catering business. 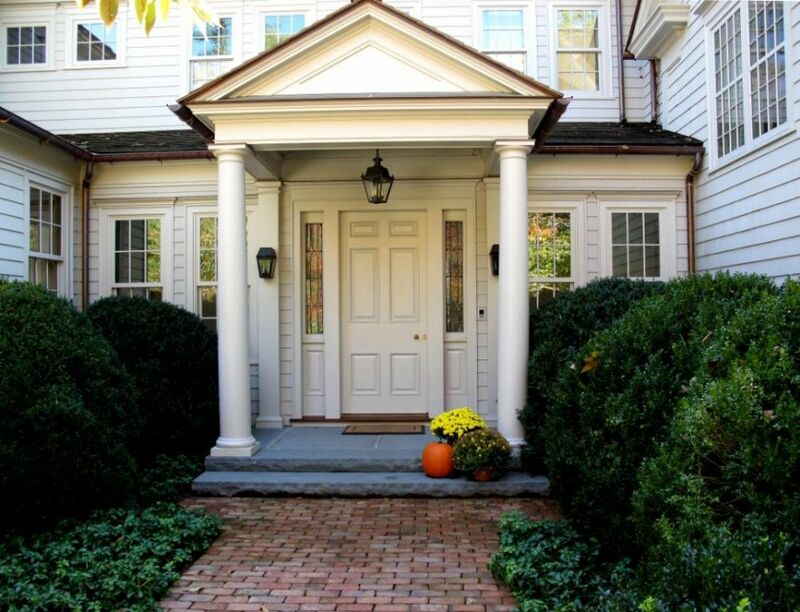 The new owners of the property renovated the home extensively, connecting the main house to the carriage house with a series of new galleries and rooms, including a large family room. The second floor was also extended to include a lavish new master bedroom suite. The kitchen, study and bathrooms were all renovated and the dining room and parlour were extended to expand their square footage. 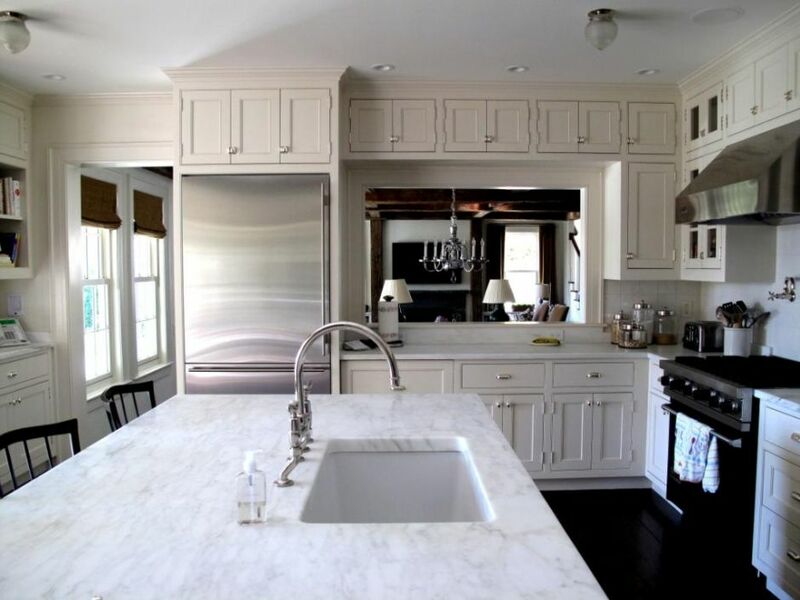 The redesign was handled by John Fifield of FPF Architects in Fairfield, Connecticut. For the new owners, the aim was to keep the basic core of the home intact (knocking it down to start from scratch was not an option for them) and to build upon it in order to accommodate their family. Below are photographs of the new Turkey Hill, inside and out. This photo shows the extension on the back of the house, which now houses a large eat-in family room and a second staircase to access the second story, which was also extended. The original main house can be seen at right. To the far left, you will see the carriage house, which is now connected to the main house. New windows were added throughout the home. The main entrance was moved to the north side of the property. The original leaded-pane windows flanking the front door seem to have been salvaged from the former entrance. The second floor, as shown in this photo, also looks reconfigured from the original design. A completely new room: a combination eating area and family room that connects the main house to the former carriage house. A second staircase was also added here. The completely redesigned and renovated kitchen, which has a pass-through to the dining area and family room beyond. The dressing room of the master bedroom suite. Dreaming of waking up late here and having brunch with M. What do I have to do to get this? The dressing room is to die for.. wish I had that room. The renovations are a bit cluttery, but just a bit! I am swerving into that other universe to play on the ottoman in the dressing room, hide cookies from the kids in the cute cupboards of the kitchen, and Windex the six-over-sixes. I agree with FK, the renovations do seem a bit cluttery. I don't like the main entrance and although the kitchen is gorgeous, it seems smaller & darker (not enough sunlight!). I was hoping MSL would do a story on this. I'm just glad they didn't knock it down and build a McMansion, which is a growing trend in that area. I like The Old But The New. Change is Always Good To. But It Still Should Have A Cornerstone Of MARTHA! im surprised they changed it so much. when they fight bought it they said they weren't going to. I guess the "martha affect" wore off. Was hoping they'd leave it as is. I could definitely see that house turning into a monument to Martha one day and I would have loved to visit it! Turkey Hill was always my favorite. I don't care for the renovations at all. There's just something gut level wrong with adding on/changing this historical home. I think the new entrance is actually on the north side of the house where the side driveway was that led to the barn. Look at Google Earth and flip the orientation around. You can see the new porch roof line pretty clearly. I have felt such a sense of loss knowing what they did to Turkey Hill. I guess my memories of how Turkey Hill once was is all that's left. Thank goodness there are so many pictures of the way it used to look. I wonder how it makes Martha feel deep down inside knowing what they did to her Turkey Hill and all the hard work that went into it. I find the change to Turkey Hill even more saddening than the end of "Martha" on Hallmark. MSO has proved its resilience during challenging times. Like Joanne and Kenn, I've always loved Turkey Hill the best. Although I've only ever seen the house from the outside, the small but beautifully proportioned rooms and elegant Federal finishes were it's trademark. When Martha discovered the house in the 1970s, it was a delight to find that the previous owners had changed very little. Now, the house looks nice but not any different than other upscale new construction in New England. I would have never guessed it was Turkey Hill! It's pretty but I do like Martha's version of Turkey Hill much better. The new version seems a bit cold. For me, it's not about living vicariously through anyone it's about appreciating original architecture and landscape design and not seeing old beautiful homes and mature gardens drastically changed or worse yet, completely destroyed. The National Trust for Historic Preservation has been working tirelessly for years to save historic homes and buildings and we have far too few of them left. Maybe 48 THL isn't on The Register but it is (or was) a historic home and location. Unfortunately it will never be the home it once was and that to me is sad. I know all of you are nostalgic for Martha's Turkey Hill, but I think the new owners have done a beautiful job with the remodel and have made it look contemporary and functional. Andrew, I have told you about my Turkey Hill obsession before. I can say I feel the original front entrance is still there and the new North entrance is a new one. The original door opened to the right. This picture shows the door opening to the left! To the right is the Bathroon, or where the bathroom was when Marth lived there. If I find more I will let you know. I can't get over the changes!!! Another example of the Ameerican story of the triumph of money over taste...the Bergs should have built from scratch if they wanted all the cliches of the more-money-than-taste crowd. 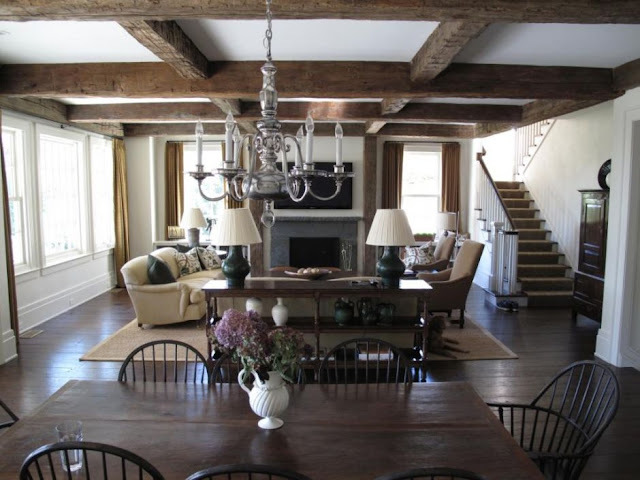 "Master suites" in an 1805 farmhouse? I am surprised they didn't gut the whole house to make a "great room." And the kitchen is so suburban looking, complete with "pass through"--I thought those went out in the seventies. I do wonder where all the salvage went from the Berg's depradations, though...Martha artifacts on CT craigslist? I've been wondering lately what became of Turkey hill, now I know!! thanks for the update..
Just to reassure everyone, Turkey Hill looks the exact same from the road. I think it's important to consider the needs of a modern household...and to be fair, Martha has done that herself by making quite a few changes to the historic buildings at Cantitoe Corners, and I think they look all the better for it! They disturbed an architectural icon. Lame.